Last Sunday, late in the afternoon, P & I crossed the Theodor-Heuss bridge and climbed down to the riverside, for a walk along the Neckarwiese. 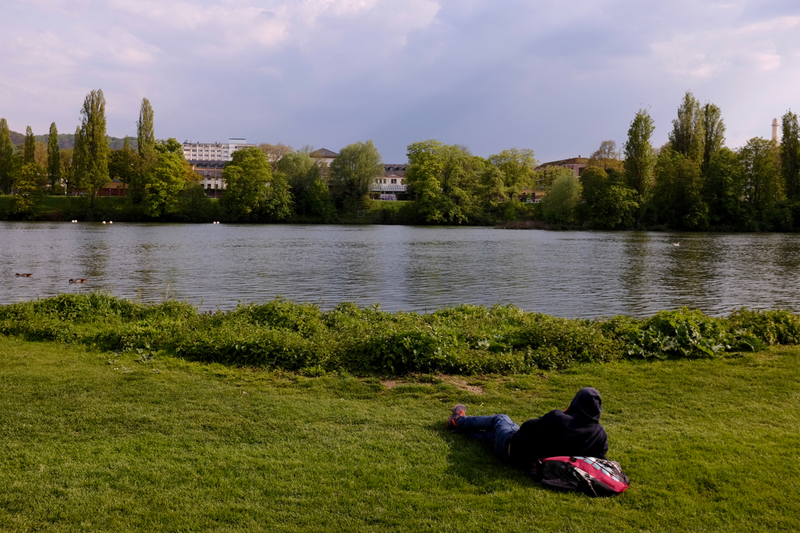 This stretch of green between the Neckar and Neuenheim is a popular spot, and on this day people were basking in the afternoon sun, enjoying the first signs of summer after a cold April. The tall poplar at the beginning of the stretch had just begun to bloom, and this state, where the tree’s inner structure shone through the thin foliage of leaves, gave it a mysteriously beautiful character, not unlike a bride’s face seen through a veil of silk gauze. We walked to the tree and sat under it. A blonde woman stood by the river ringed by four children, their attention centred on a swan with her tiny cygnets. Nearby, a gang of students sat with their speakers and musical instruments — drums, guitars, and a keyboard — while another was picnicking with a spread of snacks and beer laid out on a mat. There were families with children running about in orbits, and one Turkish group had set up a table with chairs, where they sat drinking tea and laughing. Couples lounged on the grass, and here and there we spotted a solitary man or woman, sitting or lying prone, reading or simply staring ahead. We walked next to the water and soon reached the children’s recreation area, a space of creative confusion with a troop of boys and girls running and jumping and shouting and playing on the slides, swings, and other equipment installed there. P pointed to a seesaw, which turned out to be three seesaws connected serially, so that the upward movement of one node affected not just another but two more nodes in that chain. We stood watching this strange contraption for a minute or two, trying to decipher the logic of the ups and downs. Beyond this section were two beach volleyball courts, both occupied by a pair of players on each side. Following the courts was again a long stretch of green, but here we saw fewer people lounging on the grass. Instead, following the pattern set by the play area and the volleyball courts, there were more instances of people playing: two red-haired girls tossing a yellow frisbee, a German boy with a Müller soccer shirt running after a dog, and a bunch of teenagers with Middle-Eastern features passing around a football. The din we had passed through earlier, in the children’s area, was replaced here by isolated shrieks and calls of players in a game. We sat at the water’s edge, not far from a weeping willow, staring at the Neckar’s gentle flow and following the path of geese flying a foot above water and then landing, feet first, head and body angled backwards, wings spread out, and beak sticking out, all reminiscent of the Concorde. On the walk back we chose the path that runs on the other side of the green, next to the grand mansions that stand facing the river. The benches here were occupied by people who sat looking at the Neckarwiese, and some of them were black — probably refugees, given how these young men were dressed in clothes that seemed out of character here, and how they sat in groups, or alone, watching the riparian crowd with a mixture of curiosity, awe, and perhaps longing. On the grass, a young blond-haired father sat reading to his daughter from a brightly illustrated storybook. A covey of burkha-clad women sat in a circle, like stones at a prehistoric site. Nearby, three middle-aged men with beards were playing cards. A young man in dreadlocks was strumming his guitar, watched by his swaying friends. There was a woman playing with a dog, patting and poking it with glee, and it emerged that the dog belonged to a girl passing by, who watched this scene with amusement before calling the dog back to her. A middle-aged couple walked past us speaking in Arabic, followed by a teenage girl with freckles jogging at a leisurely pace, wearing fluorescent pink shoes. Next to some groups a bicycle or a pram was parked, and in the middle of the green, almost invisible in all this visual noise, were two green garbage bins. Back on the bridge, we stood at the edge taking in the long view of the riverine scene. From this height the Neckarwiese appeared small, merely a patch of green sandwiched between the muddy river and the tall mansions of Neuenheim, and the people gathered on it seemed like strange creatures, sitting in groups or in pairs, scurrying about with purpose or wandering aimlessly. The specifics we had seen earlier blurred into indistinguishable dots, which led, momentarily, to an illusion of timelessness: the scene had not changed in a hundred years, and would not change for a hundred more.